NATO Secretary-General Jens Stoltenberg speaks during a media conference at NATO headquarters in Brussels, Nov. 7, 2017. NATO Secretary-General Jens Stoltenberg said Taliban bases in Pakistan pose a “big challenge” to efforts aimed at bringing peace and stability to Afghanistan. Stoltenberg told reporters Tuesday at the alliance’s headquarters in Brussels that he regularly raises the issue in meetings with Pakistani leaders and will continue to do so. “We have to address the big challenge that [the] Taliban, the insurgents are working also out of bases in Pakistan. And we have raised that several times. It is extremely important that all countries in the region support efforts of the Afghan national unity government and that no country provide any kind of sanctuary for the terrorists,” said the NATO chief. FILE - A Pakistani soldier stands guard at a newly erected fence between Pakistan and Afghanistan at Angore Adda, Pakistan, Oct. 18, 2017. He spoke just hours after a top Pakistani Foreign Ministry official again rejected allegations terrorists are operating out of her country. Foreign Secretary Tehmina Janjua while briefing a parliamentary committed on foreign affairs said Islamabad told Washington in recent high-level bilateral talks that all areas in Pakistan have been cleared of terrorists. Janjua reiterated Pakistani forces will take immediate action if the United States provides “actionable intelligence” regarding the presence of terrorists in the country. She went on to assert terrorists are operating not out of Pakistan, but from across the Afghan border. "In Afghanistan, 45 percent of the country is not under government control, which is why the Haqqani network and other terror groups do not need a safe haven in Pakistan," Janjua said. Stoltenberg reiterated NATO will continue and strengthen its financial and military training support to Afghanistan, saying the number of foreign troops in the country will be increased from currently around 13,000 to a new level of around 16,000 troops. 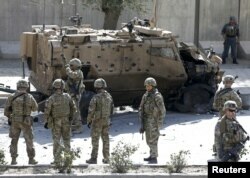 FILE - NATO soldiers stand near a damaged NATO military vehicle at the site of a suicide car bomb blast in Kabul, Afghanistan, Oct. 11, 2015. “We will not go back in combat operations but we need to strengthen the train and assist and advise mission, the Resolute Support mission, to help the Afghans break the stalemate, to send a clear message to the Taliban, to the insurgents that they will not win on the battleground,” asserted Stoltenberg. The only way the Taliban can achieve anything, he noted, is by sitting down at the negotiating table and be part of a peaceful negotiated political solution to the Afghan war. 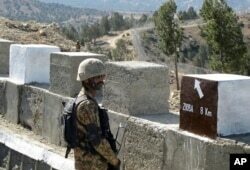 The Islamist insurgency, however, has refused to engage in talks until all foreign forces withdraw from Afghanistan. The Taliban has instead intensified its attacks against Afghan security forces, particularly since U.S. President Donald Trump announced his new strategy for breaking the military stalemate in Afghanistan. Insurgent attacks on Afghan forces have killed hundreds of army and police personnel in recent weeks.